Little League pitching is awesome, but what are the implications? SOUTH WILLIAMSPORT, Pa. — Connecticut’s Ethan Righter faced a mighty task on the opening day of the Little League World Series last August. His opponent was a club from Holbrook, New Jersey, that averaged more runs — eight — than any U.S. team headed into the tournament. Righter pulled his ball cap low over his wavy hair and shut down New Jersey, striking out seven batters and allowing just two runs as he picked up the win. The next day in South Williamsport, three pitchers from North Carolina threw a combined perfect game against South Dakota, while striking out 10. Carson Hardee is part of the North Carolina powerhouse trio of pitchers that threw back to back no-hitters. Photo by Erin O'Neill. And the pitching performances at the LLWS only got better from there. North Carolina threw a second no-hitter in its next contest against California, and Righter faced New Jersey again less than a week later, striking out eight as his team from Fairfield, Connecticut, eliminated Holbrook, 12-2. In all, there were a total of seven shutouts over the first 21 games at the LLWS this season and nine out of 30 games once the tournament had concluded. While the all-time record for shutouts in a tournament is 13, set in 2006, the bottom line is the caliber of Little League pitching is devastating, and may even be at a peak that will last for many years to come, a statement that’s not hyperbole since the tournament plans to age out some of its older competitors. It isn’t enough, anymore, for Little League pitchers just to throw hard once they reach the World Series. Most hitters in the LLWS can catch up to a 70-plus-mph heater thrown over the middle of the plate – they wouldn’t have made it this far if they couldn’t – which makes pitch location and breaking balls that much more important. Pitchers have responded by learning their curves and sliders before they’re allowed by mom and dad to see a PG-13 movie. Righter’s fastball in the opening game against New Jersey, for instance, was clocked consistently around 68 mph, a velocity that most LLWS hitters can barrel up. What made that fastball so effective, however, was his knee-buckling curveball that crossed the plate about 10 mph slower. Batters had to think about prolonging their swings enough to connect with the curve. Factor in the tailing bite to Righter’s breaking ball, and hitters were baffled, reacting to where they thought the pitch would be when they got their bats around. All this happened in less than a second. For fans watching in the stands or on ESPN, it was amazing to see. But there’s a catch to all this brilliant work on the mound. There’s widespread concern about the strain placed on young pitchers’ arms from breaking balls, and there are conflicting thoughts regarding when it’s appropriate to begin throwing them. And how much pitching is too much? Little League sets pitch-count limits for all its players, but it can’t control how often an athlete pitches when he’s not playing in a Little League game. With the emergence of travel baseball leagues at a younger age, many Little League pitchers also take the mound for select travel clubs. Plus, baseball is now becoming a year-round sport for kids, many of whom are focusing on playing baseball, and only baseball, before they even reach high school. The additional throwing these pitchers do in the time they used to spend playing football, basketball, soccer and other sports can also put more stress on their arms. All of this, together, begs the question: Is there a correlation between Little League pitching dominance and arm fatigue and injury for those pitchers as they get older? And if so, is the injury risk — up to and including Tommy John surgery — worth it? One thing that adds a twist to Little League are the pitch counts, which are in place to ensure these pre-adolescent players aren’t putting too much stress on their arms. Once a player throws more than 20 pitches, he has to have one rest day between his appearances on the mound. He has to have two days of rest if he throws between 36-50 pitches, three days for throwing 51-65 pitches, and four days once he throws more than 66 pitches. He must leave a game after his 85th pitch (Little League games are six innings). At the LLWS, four days might as well be an eternity. In four days, a team can lose twice and be eliminated from the tournament. The North Carolina team had an interesting strategy for using its three most dominant pitchers: Chase Anderson, Matthew Mattijs and Carson Hardee. Instead of starting one of them and riding him as long as they could, Fields, the team’s manager, elected to use all three of them each game for a set number of pitches. That way, the self-proclaimed “Three Stooges” could take the mound more frequently — ideally, every game — with fewer days of rest. The trio combined for 17 strikeouts and two walks over their first two games. Anderson thrived with his pinpoint accuracy, giving the team a strong anchor to start the games. Matthijs’ 76-mph fastball translates to a 99-mph heater in the major leagues. Hardee’s specialty was a knock out curveball that worked wonders at the back end of games. The North Carolina squad, from Greenville, didn’t end up winning the tournament. It didn’t even make it to the LLWS championship game, despite losing only one game by one run, which came in the U.S. bracket’s final against Texas. Still, John Beauge, a reporter, editor and photographer for The Patriot-News in Harrisburg, said North Carolina was “by far” the best U.S. team, mostly because of its pitching staff. Beauge has been covering the LLWS since 1957, and he called the back-to-back no-hitters feat “highly unusual.” No other U.S. team has ever thrown consecutive no-hitters. The team that represented the U.S. in the championship game, from Lufkin, Texas, was the first team to record a hit off North Carolina in the tournament, though Greenville still won the game. Texas, however, got the best of Carolina the second time around. 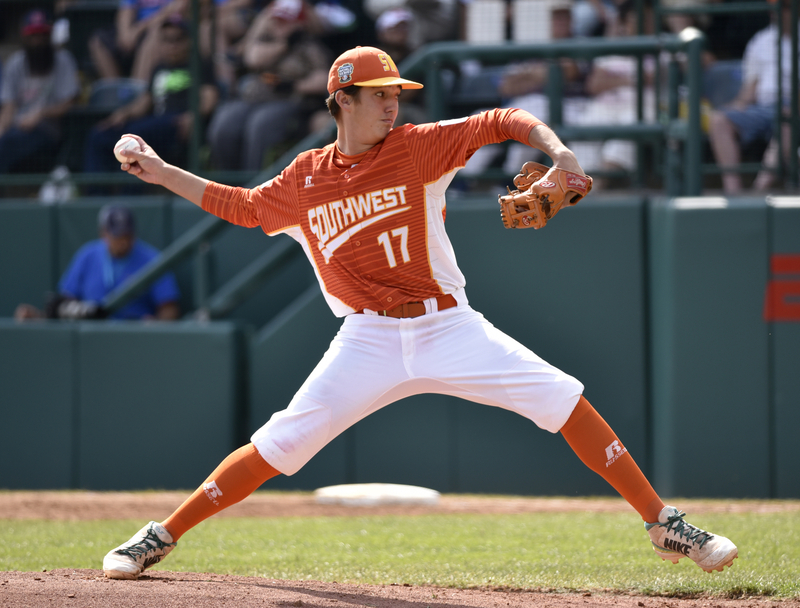 Texas, too, had a dominant pitcher as Collin Ross struck out 13 batters and posted a 2.81 ERA in 10 2/3 innings during the LLWS. He pitched Texas to victory over North Carolina in the U.S. championship game to send his team to the finals. Collin Ross of Texas, champion of the Southwest region, pitches in the first inning of the US Championship of the Little League World Series. Photo by Erin O'Neill. The difference between Ross and two of the Three Stooges, though, was their number of appearances. Anderson and Mattijs each pitched in four LLWS games, while Ross made each of his two eligible starts, maxing out his pitch count in both games. Overall, pitching has been so dominant over the past few seasons that Little League is taking measures to counter the lack of offense. Starting next season, the age cutoff for Little Leaguers will be moved back from its current April 30 date to Aug. 31. Any kid who turns 13 before the Aug. 31 deadline will no longer be eligible to play in the World Series. The decision to change the cutoff date was announced in 2015, and at the time, Little League spokesman Brian McClintock said the decision wasn’t made to reduce the gap between pitchers and hitters. Instead, the league found the children wanted to compete with and against players from the same grade as them. A player’s age at the end of August often determines his grade in school. But even if aging the older players out of the LLWS does level the supposed advantage 13-year-old pitchers have over 12-year-old batters, changing the cutoff date does little, if anything, to help the pitchers preserve their arms. Pitchers use the same tools to dominate on the Little League mound as they do when they reach the full-size field, which is where they play once they reach the cutoff. By moving the cutoff date forward, kids actually have to graduate to the larger field dimensions sooner. Those pitchers whose 13th birthdays fall between April 30 and Aug. 31 will now have to throw to batters from 60 feet, 6 inches away instead of the 46 feet they would’ve been throwing from had the cutoff not been changed. Tracking the number of pitches a player throws is undoubtedly a productive means to make sure he doesn’t overuse his arm. But as youth baseball evolves, many wonder whether it’s the most effective method for preventing injury. Rob Cooper, the head baseball coach at Penn State, said he was once a big proponent of pitch counts. But now, as he digs into more studies regarding arm care, he wonders about the legitimacy of the pitch counting metrics. “Why do we come up with the numbers that we come up with for pitch counts? They’re just arbitrary,” Cooper said. “If a guy throws 101 pitches, all of a sudden, we think he’s throwing a lot. If he throws 99, he had a good pitch count. Right? That’s a difference of two. As a Division I coach, Cooper is constantly searching for the next group of players to recruit, many of whom are pitchers. Sometimes, he’s evaluating high school freshmen, who aren’t much older than those competing in the LLWS. While recruiting, Cooper not only has to project how these players will develop as they get older, but he also has to factor injury risks into his decisions. On top of that, Cooper has two sons playing competitive youth baseball, and through them, he sees how arm use affects pitchers even before they play high school and college ball. To him, counting pitches isn’t a one-size-fits-all method to curb injury and fatigue. Cooper’s younger son, Jake, has had recurring arm issues, and the coach would take his son to the doctor, who would conclude Jake needed rest to cure what was diagnosed as tendonitis. After resting for the prescribed period of time, Cooper said, Jake would start throwing again. Not long after, the pain would return. Cooper did say a more accurate measure for limiting arm use would be to keep tabs on the number of pitches a player throws in a week. Or even better, he said, it’d be best to tally each of his throws during the week, not just his number of pitches. Some people within baseball agree that tracking all the pitches a player throws in a week, such as during bullpen and training sessions, warm-ups and games, is the most reasonable way to control arm use. New technology makes what sounds like a tedious process much easier than before. Re-Play Athletics, for example, has a pitching-development technology that tracks pitches on its platforms for each player who uses it and allows that information to be shared between him, his parents and all of his coaches. It sends alerts via push notifications to smartphones and tablets that inform users when a player is approaching and has reached his maximum pitches threshold. Additionally, the technology’s platform can track a pitcher’s performance. With all this information, pitchers are given a recommended workout program, nutrition plan and rest guidelines. Alan Discount, chief executive of Re-Play Athletics and the product’s architect, said he created the technology because he was disappointed with the lack of information available to most volunteer youth coaches when it comes to injury prevention for pitchers. Aside from the different types of throwing – as a pitcher, a position player or with a friend in the backyard – certain pitches also have varying effects on a player’s arm. It’s long been suggested that a breaking ball puts stress has on a pitcher’s arm, especially when he’s still growing. Some sports scientists advise children to wait to throw curveballs until they reach age 13 or 14. Cooper at Penn State argues players should only throw fastballs until they reach high school. Glenn Fleisig, the research director at the American Sports Medicine Institute, conducted several studies relating to the stress curveballs and other breaking pitches place on elbows and shoulders. The results of the studies showed that curveballs thrown with proper mechanics do no more damage on a pitcher’s arm than throwing a fastball. However, Dr. James Andrews, a co-founder of the American Sports Medicine Institute, who is among the most prominent orthopedic doctors in sports medicine and specializes in elbow, knee and shoulder injuries, still warned against throwing breaking pitches too early. Nonetheless, youth players are still snapping off breaking pitches from 46 feet away. With the way youth baseball has progressed, pitchers are at a disadvantage if they don’t throw curveballs. Without a breaking pitch, it becomes that much more important for a Little League pitcher to locate his fastballs on the corners. But if that pitcher has an off-speed pitch, batters have to react to the speed of the incoming pitch instead of just sitting on the fastball. That’s what made Righter, the ace from Connecticut, so effective. Randazzo said he doesn’t have a definitive answer about when kids should start throwing curves. But after reading and listening to sports doctors who specialize in arm care and injury prevention, Randazzo said he doesn’t worry so much about kids throwing curves as he does about them throwing too often. Counting pitches, Randazzo said, is the best way to prevent overuse, though he doesn’t think simply following the limits set by Little League is the most effective method to do this. While no youth pitcher should exceed the maximum that Little League has put in place, Randazzo said, age isn’t the only variable that should determine how many pitches an individual should throw. The time of year (season and specific month), geographic location and physical preparation factor into the number of pitches a player should throw to avoid overuse. Considering all of this, Fairfield American LL, the Connecticut team’s local league, sets its own pitch-count limits that are more stringent than the maximums Little League sets nationally. For example, Fairfield American has a rule in place that prohibits any pitcher from throwing more than 50 pitches in any game played before May 1. Before then, the weather in Connecticut is still cold, and throwing in the cold too much increases the risk of arm tightness and fatigue. Plus, many youth pitchers in the Northeast don’t start conditioning their arms for the season as early as they should, due to the winter weather, and therefore don’t have the stamina to safely throw more than 50 pitches in a game. And after pitching, players need rest, especially those with developing arms. Andrews said young pitchers should take at least two months off each year from overhand throwing sports to give their arms enough time to recover. He opposes the trend toward specialization in youth sports — playing baseball exclusively, for instance. “Everybody regardless of what they do needs certain times off,” Andrews said. “That is why also, for example, when we raise crops on a field you rotate the crops from field to field to give the field a chance to recuperate for the next crop development. Many times, for a coach who wants to prevent overuse, the biggest obstacle isn’t the 12-year-old pitcher nagging him for the ball. Instead, Randazzo said, parents have a tendency to want their kids to pitch as frequently as possible without weighing the negative consequences that could surface in the future. While it’s great to have so many opportunities for young athletes, caution is still the watchword for those who have been around the game.